Praying mantises are a beneficial predator in your garden, they eat other insects and keep the pest insect population down. 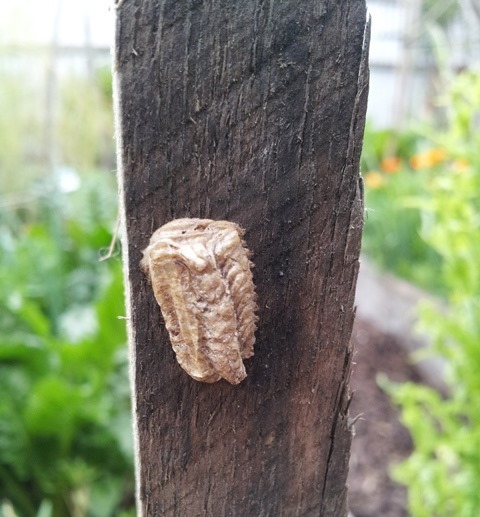 It’s important to be able to recognise their eggs so that you don’t accidentally damage them, that way you’ll be rewarded with a garden full of little praying mantis nymphs in spring when they all hatch! It’s common for them to lay eggs around the garden, and you’ve probably seen them but not recognised them. 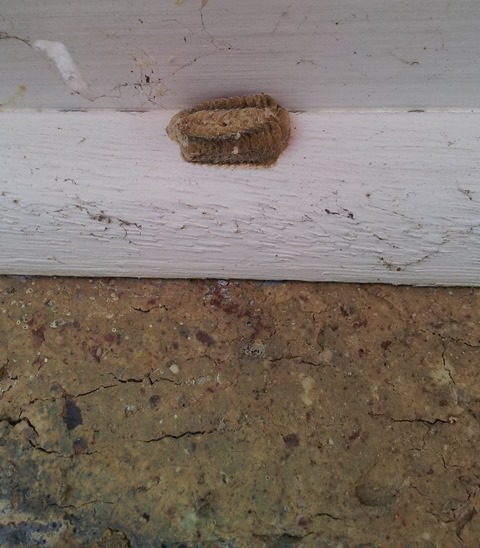 They’re not actually eggs bur egg cases, called ootheca, which contain many eggs inside, from 10 to 400, depending on the species. Here are some photos I’ve taken in my garden. Be aware that they do vary somewhat in appearance from species to species. 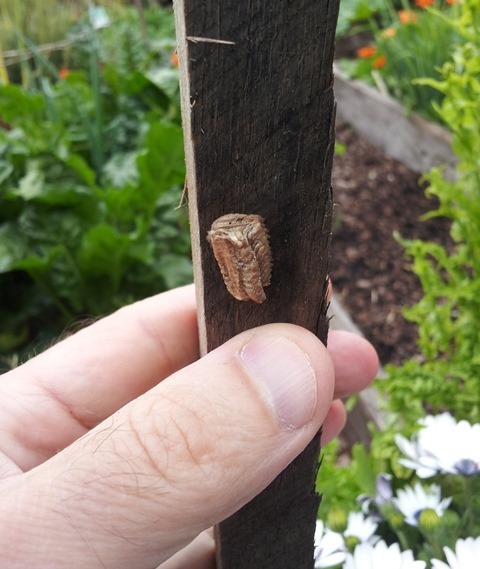 This is a picture of a praying mantis egg case on a tomato stake, with my fingers next to it to give an indication of size. Here’s a closer look. 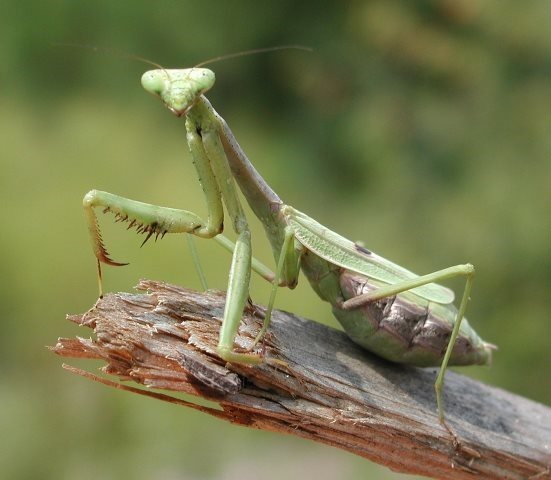 If you find them on your garden stakes or other garden objects after cleaning up your garden, leave the wooden stakes somewhere near plants so when the tiny praying mantises hatch they can quickly find cover from predators and sources of small insects for food. 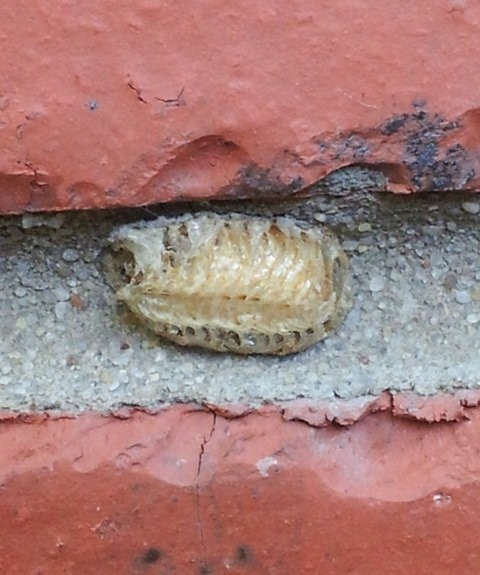 Having a densely packed garden, they’re everywhere, here’s a praying mantis egg case on the mortar join of the brickwork on the house wall. Praying mantises also glue their egg cases on painted timber surfaces, here’s the eaves of the garage roof. 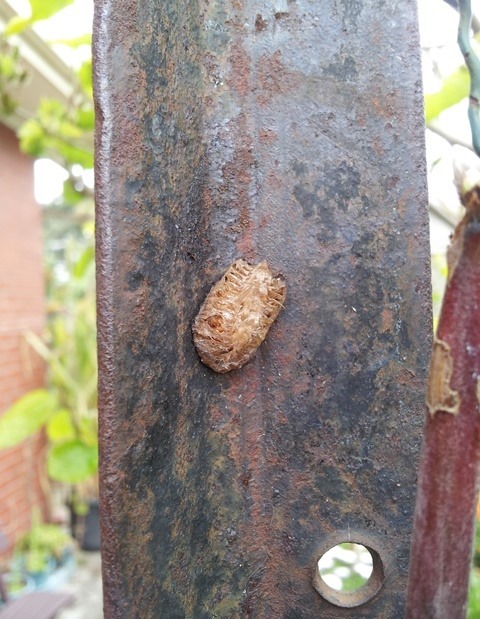 I’ve even found praying mantis egg cases attached to steel star pickets (Y-cross section steel posts) that I use to string wire between to support vines and berries. This one is rather odd shaped. 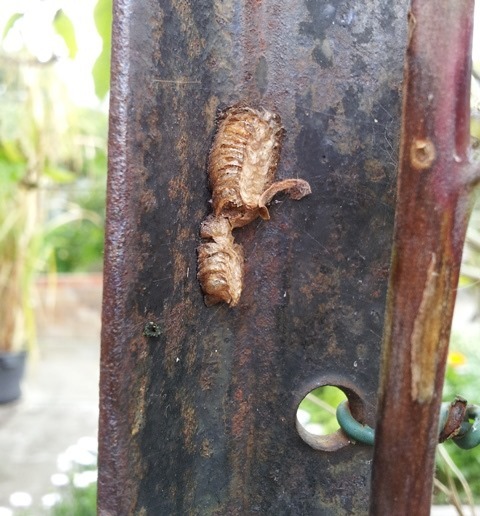 When the female praying mantis first lays the ootheca (egg case). it’s a soft, frothy structure, which hardens after a few days to create a protective enclosure which will protect the eggs through winter. The baby (nymph) praying mantises will hatch in spring and grow over summer into adults. Ensuring that these little egg cases are not damaged will guarantee a new generation of praying mantises, which will contribute to the natural pest control systems in your garden . 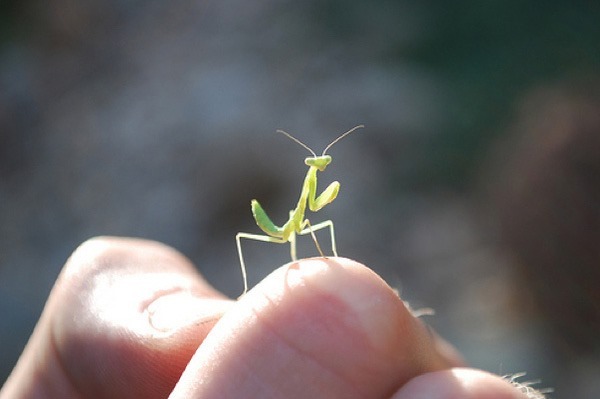 Oh, and one more thing, the baby praying mantises are really cute, they are just super-scaled-down versions of the adults, and they behave in exactly the same way, they’re literally born hunters, hunting tiny insects, doing what praying mantises do best. This entry was posted in Gardening Information, What's New! and tagged beneficial insects, natural pest control, ootheca, praying mantis, praying mantis eggs. Bookmark the permalink. What a fantastic post. I remember seeing those casings, from when I was a kid, and since. Now I know what they are. Such beautiful images too!